The research team was asked to consider a wide range of consequences of humanitarian aid in Sudan, with an emphasis on its unintended effects. As a focus for field research, the team identified two contiguous areas: northern Bahr-el-Ghazal in the SPLA zone; and, in the GoS zone, those parts of south Darfur and west Kordofan which have been most affected by population displacement from the south, along with the government garrison town of Wau (in government-controlled Bahr-el-Ghazal). Field research for the study took place between March and June 1999. It was conducted in two separate trips: two members of the team spent three weeks in Khartoum and in the government-controlled areas of south Darfur; one of them spent a further ten days in west Kordofan and in Wau; four members of the team then spent three weeks in Kenya and the SPLA-controlled areas of Bahr-el-Ghazal. Research was conducted in the operational headquarters of the organisations involved in the relief effort – in Khartoum, Nairobi and Lokichoggio – and in administrative centres, villages and relief camps in emergency-affected rural areas of north and south Sudan. Follow-up research was also conducted in London and Brussels with expatriate Sudanese and with other area specialists. Fieldwork methodology combined three elements. First, documentary research in the offices of ECHO and Operation Lifeline Sudan (OLS); second, interviews with personnel of international aid organisations and the relief co-ordination bodies of GoS and the SPLA (in the field and in administrative offices in Khartoum, Nairobi and Lokichoggio); and third, field research employing ethnographic methods in Darfur, Kordofan and Bahr-el-Ghazal. The documentary research involved an extensive survey of “grey literature”, that is to say, the accumulation of field reports engendered by ten years of OLS. The ethnographic research involved extended, informal, loosely-structured inquiry into the local effects of aid in specific communities, sometimes with interpreters, sometimes without. In some locations in the SPLA areas, we were requested to address public meetings on the subject of our research, and did so. The team was able to visit the following locations in the government-controlled areas: Khartoum, the national capital; El Obeid, El Fula, Babanusa, Muglad, El Meiram (in Kordofan); El Da’ein, Adila and Abu Karinka (in Darfur); Wau (in Bahr-el-Ghazal). In the SPLA area, we visited a large number of administrative centres and other settlements in Bahr-el-Ghazal, including the following: Ajiep, Mapel, Barurud, Panthou, Akon, Nyamlell, Marialbai, Wanyjok, Malual Kon, Mayen Abun, Turalei, Wun Rok, Panlit, Warawar, Luanyaker and Rumbek. Travel between these centres was by air, by four-wheel drive vehicle, by bicycle or on foot. Four key questions were distilled from the original terms of reference of the study. First, does humanitarian aid displace people? Second, does aid create dependency? Third, does it fuel war? And fourth, does it assist leaders to evade their responsibilities to those over whom they assert authority? These questions were discussed explicitly with interviewees; they also informed more wide-ranging discussions of social, political and economic change in war-affected communities. The research was constrained by a number of factors. First was our limited time in the rural areas of Sudan—just under 100 person-days. Furthermore, of this research timea considerable period was unavoidably spent in transit or arranging transportation from one location to another. Despite a logistical operation of formidable proportions mounted by OLS, travel in Sudan remains time-consuming and difficult. The second constraint on field research involved the security conditions that result from military administration. In the government-controlled zone in particular, both the physical movement of the researchers and their access to beneficiaries of ECHO-funded programmes were severely hampered by government security constraints. Staff of international aid agencies operating in government-controlled areas are under similar day-to-day constraints. In the SPLA areas the conditions were more conducive to free enquiry but here too we found that open discussion of the effects of aid was curtailed by an awareness of possible repercussions from local authorities. Aid agencies are in an intermittently confrontational relationship with the authorities in SPLA areas and monitoring access to certain areas and groups of beneficiaries has been denied on occasions, ostensibly for security reasons. In both government and SPLA areas, the bureaucratic procedures necessary to obtain access to the field resulted in time-consuming delays. Again, this is an experience that staff of aid agencies have every day. In the north, travel permission to OLS areas of operation currently requires approval by five separate government security agencies. Considerable staff resources are employed there in obtaining such permissions. This results not only in additional expenditure of time and money but also in damaging delays in the implementation of emergency relief projects. These difficulties seemed to us to have conspired to create a culture of low expectations in the aid community. In GoS areas in particular, we observed that expatriate and local staff of agencies had developed an overly guarded and diplomatic manner of speaking in order not to risk obstacles from government officials. We felt that this lack of candour, though understandable, threatened the effectiveness of their programmes. We stress these points because such everyday constraints on understanding the effects of aid – the self-imposed caution of agency staff and the consequent dearth of reliable information – touch on all aspects of the aid operation. They compromise its practical effectiveness, its respect for human rights, and its relationship to political developments and military movements in Sudan. This impoverishment of the information economy is rarely remarked upon: there is, in effect, a silence about the silence. Particularly in the south, there is clear evidence that aid has saved lives, protected livelihoods and – when delivered in substantial quantities – prevented distress migration. Nevertheless, one of the main conclusions of this report is that the effectiveness of aid remains profoundly compromised so long as the underlying crisis of human rights and political legitimacy that has given rise to the need for emergency assistance in Sudan remains unaddressed. But the highly restricted information environment makes it difficult to discern or discuss or take measures to improve this underlying human rights crisis. This is a matter on which donors and implementing agencies need to develop a common policy and identify the means for its application. Notwithstanding the constraints mentioned above, we were able to hold discussions with a large range of Sudanese, both northerners and southerners. They included government officials and officials of the SPLA administration, SPLA officers and other ranks, traders from north and south Sudan, chiefs and spiritual leaders, local residents and displaced people in many locations in Bahr-el-Ghazal, south Darfur and west Kordofan. We are grateful to the Sudanese who shared with us their perceptions of the aid effort and the war, sometimes at risk to themselves. We would also like to acknowledge the assistance of officials of UN organisations, international NGOs, indigenous NGOs and the relief organisations respectively of the GoS and the SPLA. Our thanks to them for expediting our research and for sharing their knowledge with us. Despite our observations on the poverty of the information economy, we note a number of promising developments in relation to aid. In the north, since the fieldwork for this report was conducted, the government, in co-ordination with UNICEF and local and international NGOs, has established a Committee for the Eradication of Abduction of Women and Children which is mandated to address the problem of slave-holding in Darfur, Kordofan and elsewhere. 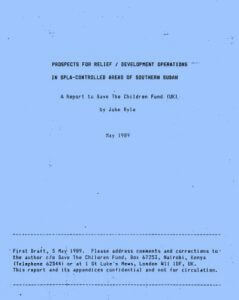 In the SPLA areas the Mapel Conference in 1999, which some members of the research team attended, confirmed a new openness in discussion between SPLA officials and staff of international aid agencies concerning their respective culpability for the failures of emergency aid during the 1998 famine in Bahr-el-Ghazal. Such initiatives, involving co-operation and exchange between administrative authorities, UN agencies and NGOs, deserve to be supported – and to be closely monitored. They may represent the beginnings of a recognition of the central place of human rights issues in the emergency. But true rights-based programming will have to extend further: to systematic support for freedom of information and the right to political representation and access to justice. Promotion of these key rights needs to be clearly distinguished from support for “rights-based” programmes that aim at short-term improvement in basic social and economic rights, such as the right to a livelihood and the right to freedom from hunger. Programmes that aim to promote basic social and economic rights in the absence of political rights may serve to perpetuate the unfeasible idea that some form of development can be achieved in the midst of an unresolved human rights crisis. Humanitarian agencies may not be the most effective vehicle for addressing this crisis, but without political rights the basic human needs that humanitarian agencies seek to meet, cannot, except in the short term, be effectively addressed. It should be stressed that our field research was limited to one part of the Dinka area of northern Bahr-el-Ghazal and one of the areas of northern Sudan where displaced inhabitants of Bahr-el-Ghazal are living. Although many of our observations undoubtedly hold true for the aid effort as a whole, there are significant differences between one war-affected area and another. These differences reflect ecological and ethno-political variation and different historical experiences of the war. 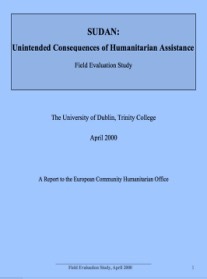 Despite useful research into the food economy of the southern region under the auspices of WFP and SCF-UK, there is as yet no general account of the various modes of livelihood of the peoples of the war-affected areas, nor of the administrative systems under which they live and under which aid agencies must operate. At the same time, the one acknowledged geographical distinction needs to be re-examined. This is the division between government and SPLA zones. The operational separation between the northern and southern sectors of OLS has engendered two distinct aid cultures; and the effects of aid in each area are indeed markedly different. But large-scale – and continuing – population movements back and forth across the lines mean that aid organisations in GoS and SPLA areas are in fact dealing with a single phenomenon. Although there has been some improvement in this regard over the last few years, notably in the livestock sector (where, for example, co-operation between Tufts University and OLS has resulted in better understanding of livestock movements within and between north and south), the unitary nature of the phenomenon is still insufficiently reflected both in operational liaison between northern and southern sectors and in the information economy of OLS. The population movements themselves, which are crucial to aid strategy, remain almost entirely undocumented. We have tried in this report to bring together consideration of aid in a government-controlled area and in the adjoining SPLA area, but we have not been able to overcome the deeply-entrenched divide between the northern and the southern sector and the consequent lack of baseline data. It is necessary for OLS to develop a unified view of the economy of war and displacement in Sudan which would give due prominence to the complex nation-wide political crisis that has engendered the human emergency in both the north and the south of the country. 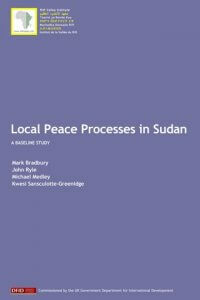 The complexity of the crisis in Sudan and the different effects of the war on different areas of the country mean that the conclusions of this report must remain, in some respects, tentative. We have striven to avoid simplistic generalizations about the impact of aid, stressing local variations and change over time in the effects of aid – and in the views of it expressed by Sudanese. We emphasize the need for institutional structures which allow flexibility in the international response to complexity. This flexibility can however only be developed on the basis of deeper historical, ethno-political and ecological understanding on the part of aid agencies involved in the emergency – and a more cogent overall policy on the part of donors. A decade of Operation Lifeline has failed to produce any sustained institutional understanding of the effect of aid on communities in Sudan or of the demographics of displacement, or of the local political dynamics of the crisis. These are culpable deficiencies. We hope this report will draw attention to the ways these deficiencies might be remedied and the manner in which a better understanding of the phenomena might be incorporated into aid policy. The challenge that now confronts the EU and implementing organisations is how they can develop their own institutional capacity to put such changes into effect. This, however, is an issue that lies beyond our remit in this report.